Applications: For smoothing down and preparing for painting, keying on previously painted surfaces. 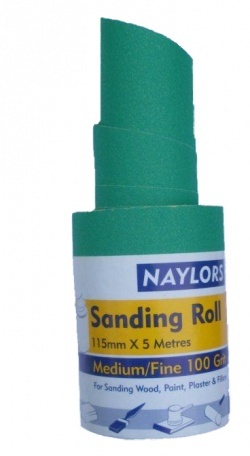 Ideal for both hard and soft wood, fillers, panels and painted and coated surfaces. Also ideal for general purpose workshop use on wood, fillers and panels. High quality aluminium oxide professional duty abrasive. Flexible 'C-Weight' paper for hand or machine use. Grade 100 Medium/Fine for smoothing down. Grade 240 Fine for keying between coats or final smoothing. 115mm width can be cut to length for most orbital sanders.